BurgerTime, the greatest game about building burgers known to man, is coming back on modern consoles in HD. Have you ever wanted to build a burger while being chased by sentient eggs? If so, and you never got to play Data East's 1982 classic BurgerTime, MonkeyPaw Games will give you another chance with the upcoming release of BurgerTime HD. Siliconera discovered an ESRB rating for the MonkeyPaw update, revealing that the studio will be bringing BurgerTime HD to the PC, Wii, Xbox 360, and PlayStation 3. MonkeyPaw has primarily been known for bringing Japanese PS1 games to the North American PlayStation Network, but also has a stated focus on licensing "known brands that have sat unnecessarily long without proper revival," and expanding on them for the modern age. BurgerTime is apparently one of those brands. 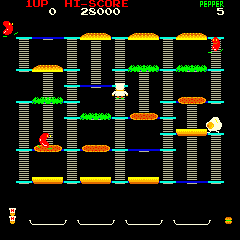 In BurgerTime, players take on the role of chef Peter Pepper as he climbs up and down ladders and walks across the various elements of burgers, like the lettuce, meat patty, and bun, to assemble a completed product. Anthropomorphic eggs, hot dogs, and pickles attempt to keep Pepper from his goal, with a limited quantity of salt and pepper the chef's only defense. The ESRB description of BurgerTime HD reveals new elements, such as grill flames and spike traps Pepper must avoid, along with new enemies like carrots and apple cores. There is currently no indication whether Burgertime HD will use the same static screens or take a new approach to gameplay. MonkeyPaw will likely make an official announcement soon.